[You may use this image without prior permission for any scholarly or educational purpose as long as you (1) credit the Hathi Trust Digital Library and the University of Michigan and (2) link your document to this URL in a web document or cite the Victorian Web in a print one..
Lapidaries are accustomed to estimate the value of precious stones less by their size than by the purity and brilliance of their colours. Something of tho same kind of test must be applied to pictures whose excellence consists not in the extent of canvas covered by the artist, nor in the variety and quantity of subject-matter he places upon it, but in the masterly disposition of whatever he introduces, in the truth with which this is expressed, and in the appeal that the work makes to our judgment and feelings by the care, and the knowledge of what is beautiful in Art, expended upon it to render it acceptable to the spectator. On these principles we may pronounce this little picture to be not a whit less worthy of consideration than Mr. Maclise's more important works, such as 'The Meeting of Wellington and Blucher,' his 'Bohemian Gipsies,' 'Marriage of Strongbow,' 'The Sleeping Beauty,' 'The Vow of the Peacock,' and others. 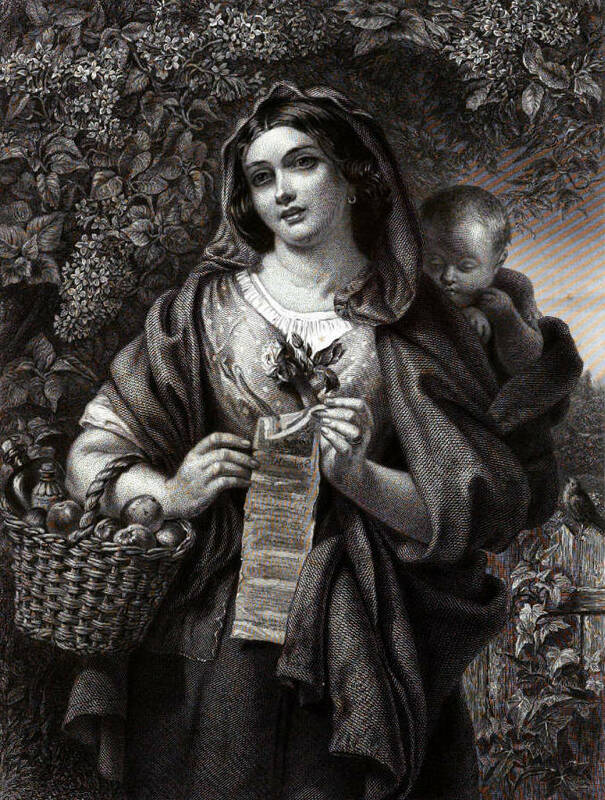 The 'Ballad Singer' is a woman with a gipsy style of face: she carries a half-naked baby at her back, and on her right arm a basket of fruit with "accompaniments," the meaning of which, in connection with her professed avocation, if it be that of a wandering vocalist, is not very clear; still the apples have afforded the painter an opportunity of putting in a few touches of brilliant colouring. She has entered the front garden of a wayside cottage, and is presumed to bo serenading its inmates with a song, the words of which she holds in her hands; a redbreast perched on the garden palings is evidently uniting his music with that of the ballad singer. The principal figure is bold and free in design, and is richly coloured; exquisite in detail, and luxuriant in growth, are the masses of lilac flowers and foliage which form the chief background of the picture, bringing into relief tho woman, whose costume and adornments, by the way, seem rather above one in her position of life. Ballad singing, as a profession, has almost, if not quite, become a thing of the past; modern taste and the "march of intellect" have ruined the vocation: but in Charles tho Second's reign, and even later, ballad singers were a kind of institution, and were compelled to take out a licence before practising their art. In the London Gazette of April 13, 16S2, appeared the following notice:—"Whereas Mr. John Clarke, of London, bookseller, did rent of Charles Killigrew, Esq., the licensing of all ballad singers for five years, which time is expired at Lady-day next; these are, therefore, to give notice to all ballad singers, that they take out licences at tho Office of the Revels at Whitehall, for singing and selling of ballads and small books, according to an ancient custom. And all persons concerned are besides desired to take notice of, and to suppress all mountebanks, ropedancers, prize-players, ballad singers, and such as make show of motions and strango sights, that have not a licence, in red and black letters, under the hand and seal of the said Charles 'Killigrew, Esq., Master of the Rovels to His Majesty," There are some old laws it seems a pity to have repealed; this, to some extent, is one of them. Were it in existence, our public streets and places of popular amusement might be freed from much annoyance. “The Ballad Singer.” Art Journal (1865): 140. Hathi Trust Digital Library version of a copy in the University of Michigan Library. Web. 21 August 2013.